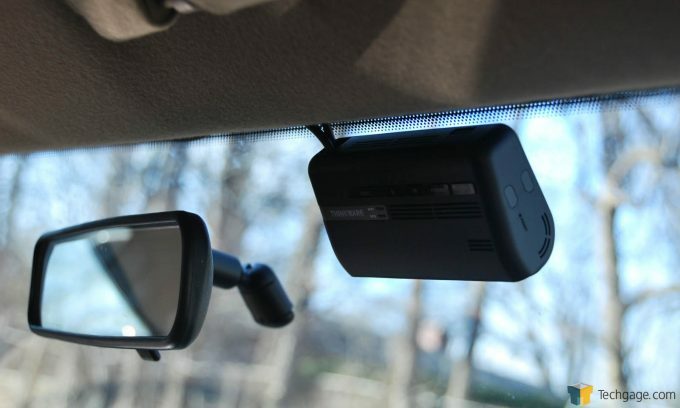 Here at Techgage, we have reviewed several dashcams, and they’ve all had their merits. As technology advances, so do the cameras and the features they offer. Today, we are looking at the THINKWARE F770, which boasts front and rear monitoring, as well as Wi-Fi connectivity. Security cameras are getting more and more relevant in the marketplace, and the same is holding true for dashcams. Driving, especially in some countries that don’t have well-developed infrastructure, can be a very dangerous undertaking. I am sure we have all seen dashcam footage at some point, whether it was the amazing meteor in Russia in February of 2013, an incredible road-rage incident, or just examples of terrible drivers doing ridiculous things. Today, we are taking a look at the THINKWARE F770 model. This unit is quite different from others we have looked at in the past. There are a few things that make this model significantly different from other more common dashcam models out there. Most notably, there is no display for this model. That’s right – no LCD screen mirroring what your camera is recording. This model also offers an optional plug and play rear-view camera. You might be thinking, how can this camera have no LCD display? How do you know it’s working? The number one thing that sets this dashcam aside from others, is Wi-Fi, app-enabled functionality. You pair your phone to this camera, and you can pull all of your video, still-shots – everything that your dashcam has captured. This feature alone is what really piqued my interest in the F770. I know from personal experience that retrieving captured video from a conventional dashcam is more trouble that its worth most of the time. You have to pop out the SD card (depending on what style of dashcam you get, it can be a bit of a job in itself), take it to a computer or laptop, pull the video off, and then remember to pop the card back in. Don’t get me wrong, this isn’t some monumental feat like scaling Kilimanjaro, but it’s certainly annoying. The thought of being able to quickly and easily retrieve video seconds after an incident by just pulling my car over and pulling the video clip with my phone, was certainly appealing. I mentioned the dual-save feature. This is something that is simply not offered in many other units. The F770 actually mirrors your data so that if there is an error with your SD card, your data is still being stored. This memory totals 400MB of NAND flash memory, so depending on your video resolution settings, it will store up to 20 videos on board. The THINKWARE F770 also touts fail-safe recording. In the event of a power loss, the F770 uses a Super Capacitor to ensure that any recordings in progress are stored. Super capacitors are large capacitors, similar to batteries, but can hold a charge over a larger temperature range, more useful in the cold where lithium batteries tend to fail rapidly. The kit that came with the F770 was pretty inclusive of everything you need to install both the front and rear cameras. The power cord is a generous length, giving you a lot of flexibility to route the cable however you need to. Also included is the rear camera that has heavy-duty adhesive tape already installed and a long micro-USB cable that not only delivers the video signal to the main unit, but also powers the rear camera. Other units are available without the rear camera and power adapter cable. Also included is the bracket, adhesive mounting tape, and the main unit itself; even some adhesive-backed cable management clips. This unit came with a 16GB micro-SD card and adapter to fit in a standard SD slot for when you want to retrieve video. Right off the bat, you will probably notice that this unit has no LCD screen, but we’ll get to that a little later. The main unit is about the size of a deck of cards, and is pretty low profile, nondescript, and very high-end fit and finish giving it a very premium look and feel. There are five buttons on the face of the body. The red lettered REC button is for manual recording. If you don’t have your car running but want to force the unit to record on demand, just press this button and the unit starts recording. The next button over is the Voice Recording button, so that you can record audio-only on demand. The next button over has the familiar Wi-Fi symbol, and this is how you pair your phone to the unit. The next button is for manually formatting the SD card, as overtime it is not uncommon to need to do that. The last button is to manually power the unit on or off. The optional rear camera is about the size of a C-cell battery, and follows the same aesthetic profile as the main unit. 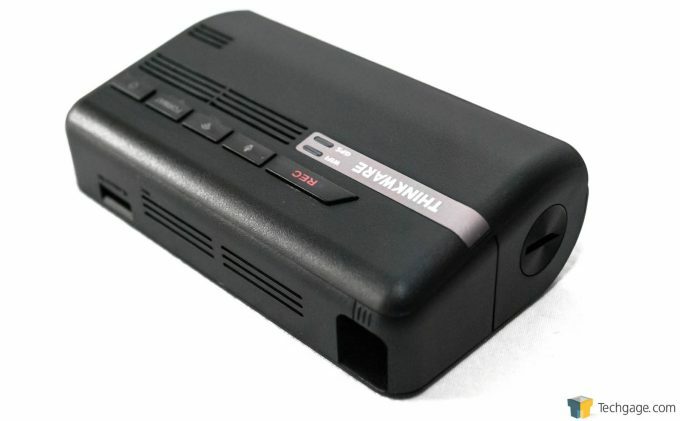 There are a few things that make this THINKWARE F770 very different from any other model of dashcam we have ever tested. First and most obvious, is the form-factor: this unit has no LCD screen. Now let’s talk about the upsides, and downsides to this. This form factor saves you space and draws less power (not really a concern when the car is running). Not having an LCD screen will attract less attention from the prying eyes of a would-be thief, not to mention be less distracting, especially at night. This low-profile form factor also makes recording something much more discreet. There is never a shortage of things in the news that would have been left unknown, or had the truth skewed if it weren’t for a device covertly recording. Most notably in recent events was a cop that pulled over an Uber driver by night, attorney by day, and told him it was illegal for him to record a police officer (it’s illegal to even suggest such a thing). Now that police officer is under investigation and without video, who knows what he would have done, and with something less obvious (like a discreet dashcam like the F770) recording, imagine the possible outcomes. On the downside, you just have to trust that the camera is in fact recording video, and that there isn’t something on your windshield obscuring the view. Having said that, it’s not much of a chore to check what is being recorded, but some may not be comfortable with not seeing the video in front of them at all times. Another thing that makes this THINKWARE F770 different from any other model that we have tested, is the fact that it is Wi-Fi enabled, which opens a whole new world of possibilities that simply won’t happen on a model that doesn’t have Wi-Fi. Firstly, you no longer have the chore of popping out your micro-SD card, finding the adapter to make it into SD size, getting your computer ready, inserting the card and then browsing the videos to find the video you need. No longer do you have to sort through layers of clumsily engineered menus that are at times counter-intuitive; you can do all of this from the THINKWARE App that is available for iOS and Android. From this app, you can set up the camera, modify the video resolution, change other features such as continuous recording, incident parking images, manual recording, as well as push the videos you choose to your smart phone. The main option though is to see what the camera is seeing through the Live View feature, turning your smartphone into that missing LCD display. One thing to clarify, you don’t need to be on your home Wi-Fi, you just simply use Wi-Fi to pair your phone to the device. I have to admit, it took a long time for me to become comfortable with using this device. I had a very hard time adjusting to the lack of an LCD display that I had grown accustomed to on other models. There are two indicator lights on the body of the unit, one indicating the Wi-Fi connection, another is the GPS which means the unit is recording. The buttons on the unit I rarely needed, as the unit comes on automatically when you start your vehicle, and automatically powers down when you shut your car off. There is a setting in the menu where you can command the dashcam to not drain your vehicle battery (if your car battery is older, or if your car sits a lot, perhaps) if the supply voltage dips below a certain value, which THINKWARE allows the user to set this value in the app, which was an incredibly thoughtful addition. 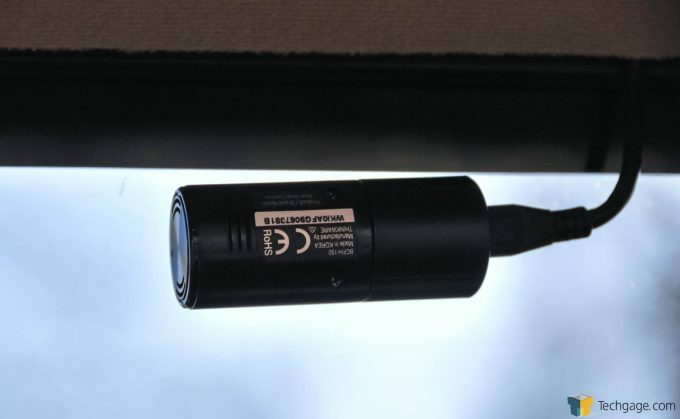 As with most other dashcams, this unit features a G sensor, which will automatically detect if you are in a collision, and write protect the video taken a few seconds before the event, and all the video after the event was triggered. This works the same way if you are using the feature for Incident Parking. Overall, this is a very nice system. It is made from high-end materials, the app is well thought out, stable, and feature-rich. The camera itself is very stable, never did I have to completely disconnect it from power to make it hard reset, or any other shenanigans that sometime plague electronic devices. The video taken is very good, on par with other top shelf dashcams, and you even have the option of having a second camera to watch the driver if this is a kid’s car, or company car perhaps, or just keeping an eye on the rear view. Low light and night recording is on par with other dashcams, the F770 does a good job with video all around. The unit was easy to install, pair with my phone, and within minutes I was done with the installation and was on my way to having front and rear video recording that is very easy to retrieve with my iPhone. The price range might keep some away at over $400 for the full kit, but if you are looking for top shelf quality, ease of installation, low-profile and app enabled, then you certainly owe it to yourself to give this THINKWARE F770 a closer look.